5 piece matryoshka doll set is made in the religion style. This set is made by hand in Russia. It..
Matryoshka nesting doll Holy Mother. Free worldwide shipping. 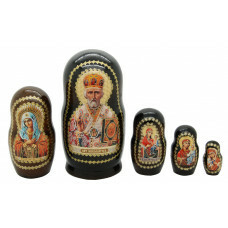 Matryoshka nesting doll Saint Nikolai. Free worldwide shipping. Matryoshka nesting doll The God. Free worldwide shipping.